For the next three weeks we at Century Corporation are going to be taking donations for Toys for Tots. So please bring your new, unwrapped toy to the leasing office at Burnam Woods, Chatham Gardens, or Old Orchard Apartments by Friday December 14th or call for a pick up. It doesn’t take much to put a smile on a child’s face. Just buy an extra toy while you’re doing your holiday shopping and drop it off to us, and we’ll take care of the rest. Toys for tots Began in 1947, when Major Bill Hendricks, USCR and a group of Marine Reservists in Los Angeles collected and distributed 5,000 toys to needy children. The idea came form Bill’s wife, Diane. In the fall of 1947, Diane crafted a homemade doll and asked Bill to deliver the doll to an organization, which would give it to a needy child at Christmas. When Bill determined that no agency existed, Diane told Bill that he should start one. He did. The 1947 pilot project was so successful that the Marine Corps adopted Toys for Tots in 1948 and expanded it into a nationwide campaign. That year, Marine Corps Reserve units across the nation conducted Toys for Tots campaigns in each community in which a Marine Reserve Center was located. Marines have conducted successful nationwide campaigns at Christmas each year since 1948. The initial objective that remains the hallmark of the program today is to “bring the joy of Christmas to America’s needy children”. Bill Hendricks, a Marine Reservist on weekends, was in civilian life, the Director of Public Relations for Warner Brothers Studio. This enabled him to convince a vast array of celebrities to support Toys for Tots. In 1948, Walt Disney designed the Toys for Tots logo, which we use today. Disney also designed the first Toys for Tots poster used to promote the nationwide program. Nat “King” Cole, Peggy Lee and Vic Damone recorded the Toys for Tots theme composed by Sammy Fain and Paul Webster in 1956. Bob Hope, John Wayne, Doris Day, Lorrie Morgan, Tim Allen, Kenny Rogers and Billy Ray Cyrus are but a few of the long list of celebrities who have given their time and talent to promote Toys for Tots. First Lady Michele Obama has been Toys for Tots number one supporter and volunteer since 2009 through mass media events, by conducting toy drives in the White House, and by volunteering to assist with the sorting of toys at local campaign warehouse sites in the Washington DC area. From 1947 through 1979, Marines collected and distributed new and used toys. On Reserve drill weekends during October, November and December, Reserve Marines refurbished the used toys.From Christmas 1980 through the present, Marines have collected and distributed only new toys. For more information, please visit Toys for Tots. This week’s Maintenance Monday tip comes from Apartment Therapy. 1. Halve Grapefruit: 1 medium to large grapefruit will clean your entire bath or shower from top to bottom, including all the fixtures. Simply cut it in half with a knife and you’ll be all set. 2. Sprinkle With Salt: Using 1 grapefruit half at a time, sprinkle liberally with salt. Wet your bathtub and sprinkle the remaining salt around the bottom. 3. Take That Scrubbing Bubbles!Scrub your grapefruit around your shower or tub, making sure to slightly “juice” the citrus over each fixture and lifting it every few seconds to pick up fresh salt from around the tub instead of just pushing it around. 4. Rinse: When all is said and done, simply rinse away the pulpy bits and the salt and your shower is as good as new. Not only is it clean, it will smell so fantastic you’ll want to curl up in it and read a book. Ok, probably not, but you get the idea! This technique will get thick grime and dirt rings off your shower area and does amazing work on cast iron tubs especially. You can also use this method to clean your sinks, toilets, tile and more — it just depends on how grapefruit crazy you want to get! Some favorite Thanksgiving recipes from the staff at Century Corporation are Cornbread Casserole, Sweet Sweet Potatoes, Meatballs with Sweet Sauce, Sweet Potato Casserole, Acorn Squash with Harvest Rice Stuffing, Baked Macaroni and Cheese, and Red Sangria. stir into casserole along with muffin mix, blend thoroughly. Bake 35-40 minutes or until center is firm. (if cans, look for the lighter natural syrup, not the heavy syrup). Beat together the sweet potatoes, butter, egg, milk, sugar, and spices. Bake at 350 degrees for 30 minutes (not covered). Pecans. Sprinkle on top of the casserole and bake. Preheat oven to 400 degrees. Cook macaroni, drain, then set aside. Melt butter in a large saucepan. Add flour, salt, & pepper, then whisk until blended well. Gradually add milk and cream while continuously stirring. Bring mixture to a boil; continue to boil for two minutes. Reduce heat, and cook for ten minutes while stirring. Add shredded cheese and simmer for 5 minutes, or until cheese melts. Remove from flame, and add macaroni to saucepan. Stir until the cheese coats the macaroni. Shift macaroni to a buttered baking dish, and layer the top of the macaroni with bread crumbs. Bake twenty minutes until golden brown. Combine the lemon, lime, orange, apple and sugar in a large pitcher. Pour in the wine and brandy and stir until well blended. Regrigerate for at least 4 hours or until thoroughly chilled. Just before serving, add ice cubes and fill the pitcher with club soda. Stir briskly until it is very cold and serve it in chilled glasses. Some favorite Thanksgiving traditions from the staff at Century Corporation are watching the Macy’s Thanksgiving Day Parade (which started in 1924), watching Miracle on 34th Street, eating a turkey sandwich for dessert at 9pm, celebrating with family, playing football games in the yard while the meal is being prepared, little kids eating at the card table while the adults eat at the big table, eating the neck as an appetizer after it’s cooked for the gravy, and donating food to families in need. Here is a great cleaning tip that may help you out this Thanksgiving. Usually when you’re talking about having flour all over your kitchen, it’s usually because your getting down with some baked goods, not cleaning! One of the simplest cleaning tips we’ve used time and time again is not only inexpensive, but chemical free and has yet to let us down! After cleaning your sink with a paste of baking soda and water, dry the sink out completely and shake in some flour. We use roughly 1/4 cup, though to be honest it’s not really a measuring thing — more of a dump a little out and call it good, kind of thing. Simply buff your sink with a soft cloth rag and keep at it until your sink is glistening. Wipe out leftover flour with your towel and shake into your compost bin or trashcan. It’s as easy as that. Although it might not be as practical on small appliances, this tip still works great, just make sure to use smaller amounts of flour and use a small brush to get the flour back out of tiny crevices. Make sure to use this trick when moving out of an apartment, your landlord will be shocked! It’s a small way to make a big impression for mere pennies! This week’s Maintenance Monday tip is brought to you by Apartment Therapy. Welcome to Part Two of Century Corporation’s Thanksgiving Recipes and Traditions. Can you believe it is only one week until Thanksgiving? Our staff has shared some of their favorite recipes and traditions. We hope you enjoy them. 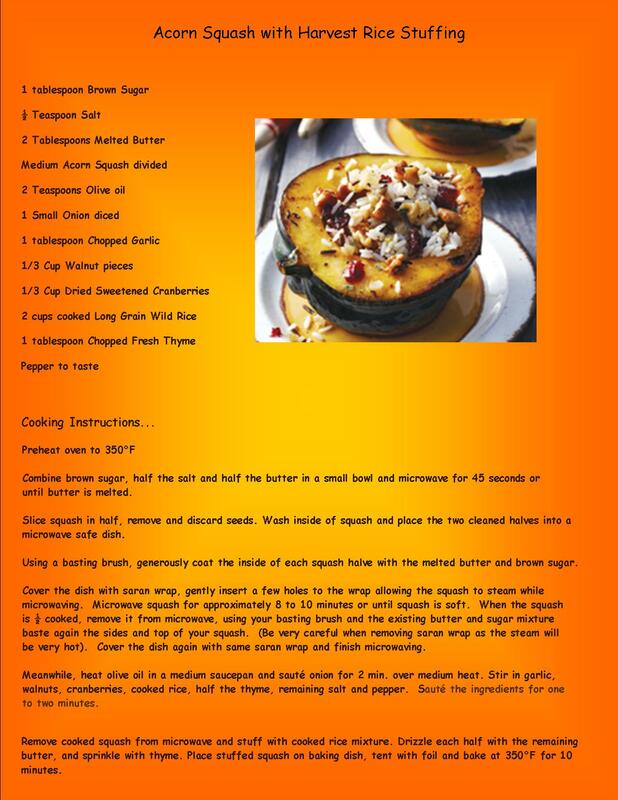 Some favorite Thanksgiving recipes from the staff at Century Corporation are Sweet Potato Casserole, Acorn Squash with Harvest Rice Stuffing, Baked Macaroni and Cheese, and Red Sangria. Some favorite Thanksgiving traditions from the staff at Century Corporation are celebrating with family, playing football games in the yard while the meal is being prepared, little kids eating at the card table while the adults eat at the big table, eating the neck as an appetizer after it’s cooked for the gravy, and donating food to families in need. Please have your Thanksgiving food donations in front of your door today Nov 15 for pick up, or take them to the leasing office. Today’s Maintenance Monday is more about policies and procedures than a maintenance tip. If you have an alarm system set in your apartment, please be sure to inform the leasing office and maintenance department of your access code. Also when calling in for a maintenance request, please inform the maintenance department that you have an alarm set and give them the arm/disarm code in order so maintenance can enter your apartment. 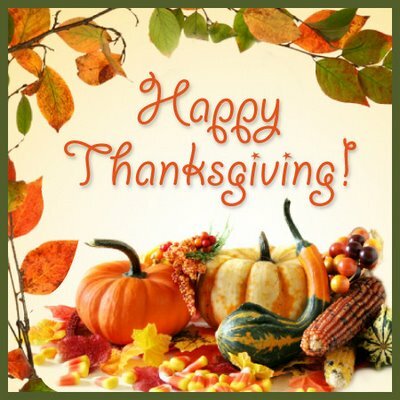 Thanksgiving is all about family, friends, food and football. What could be better than that? For the next two blog posts, we at Century Corporation are going to share some of our favorite Thanksgiving recipes and traditions with you. But first, a little Thanksgiving history lesson. Some favorite Thanksgiving recipes from the staff at Century Corporation are Cornbread Casserole, Sweet Sweet Potatoes, and Meatballs with Sweet Sauce. Some favorite Thanksgiving traditions from the staff at Century Corporation are watching the Macy’s Thanksgiving Day Parade (which started in 1924), watching Miracle on 34th Street, eating a turkey sandwich for dessert at 9pm, and donating food to families in need. Please have your Thanksgiving food donations in front of your door today Nov 8 for pick up, or take them to the leasing office. Please come back next week for part two of Century Corporation’s favorite Thanksgiving recipes and traditions. One of the most important things to keep in mind while cleaning an apartment is to start with one thing at a time. As cleaning the whole apartment at once can itself seem like an herculean task, why not start part by part or room by room. The living room is the one room that will be noticed by guests first. Remember that a clean and beautiful living room looks welcoming to you as well as others! Start with putting all the things in their appropriate places like the magazines and newspapers on the table, the CDs and DVDs in their cases, plates and glasses in the kitchen, etc. Clean all the drawers, tables, electronic gadgets like the television with a feather duster. Rearrange all the things in place. Throw away the unnecessary things. Lastly, clean the floor as all the dust from cleaning the tables must now be on the floor. Vacuum the floors and mats. Kitchen cleaning is the most time-consuming of the lot. But, you got to do it and it is actually easier than it seems. First of all clean all the dishes, bowls, glasses and utensils piled in your kitchen sink. If they are difficult to clean in one go, soak them in lukewarm water and clean after 20-25 minutes. Now clean the walls and the kitchen counter tops with soap water and sponge. Also remember to clean it with clean water again. Clean all the kitchen appliances according to the manual provided. Do not clean the inner side of fridge, microwave or oven with water. Clean only according to the given directions. Check the closets and throw away the unwanted, unused or expired food items. Rearrange the remaining things according to their usage and priority. You can put a paper in the closets to prevent dust and molds from growing. Lastly, sweep the kitchen floor with a broom or vacuum it. More often than not, the bedroom is a place to pile up all the things, specially clothes. Cleaning the bedroom is the easiest of all. Let us take a look. First and foremost, pick up all the dirty clothes, papers and all other things and keep them in their proper places. The side table specially should be looked after and cleaned as it is one of the most cluttered places in a bedroom. Clean all the wall hangings, portraits, pictures, etc. with a feather brush. Wipe the mirror of the dressing table with a semi wet cloth. Now remove the old bed spreads and curtains and keep them aside for washing. Replace them with fresh and clean ones. Lastly, as usual, vacuum the floor. Actually a bathroom needs to be cleaned everyday as a part of simple hygiene. It is not difficult to clean the bathroom as it is only a small part of the apartment but most of us shy away from bathroom cleaning. Clear the bathroom cabinet of all the expired medications and unwanted toiletries. Mop the bathroom floor and let it dry naturally. If you go by the method of one at a time, you will realize that cleaning an apartment is not that difficult. One of the most important apartment cleaning tips is to clean and vacuum the rooms regularly. At least try to clean the dishes regularly so that they do not pile up and give you sleepless nights. Lastly, you can make your own apartment cleaning checklist and work accordingly to minimize the trouble of putting in a lot of hard work on one single day! 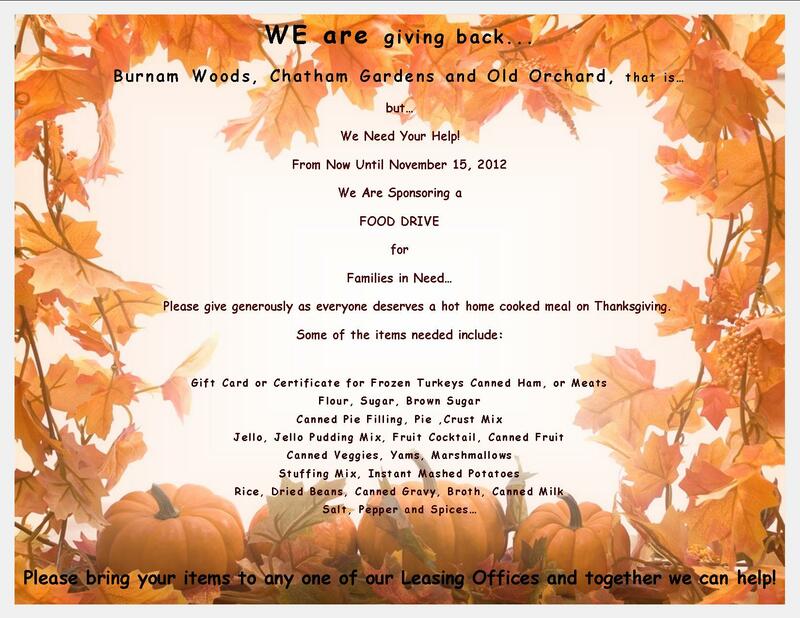 We at Century Corporation are sponsoring a Thanksgiving Food Drive for families in need. Food collected from our apartments at Burnam Woods will go to Life Source International Church. Food collected from our apartments at Chatham Gardens will go to FISH of Howard County. Food collected from our apartments at Old Orchard will go to Catonsville Emergency Food Ministries. 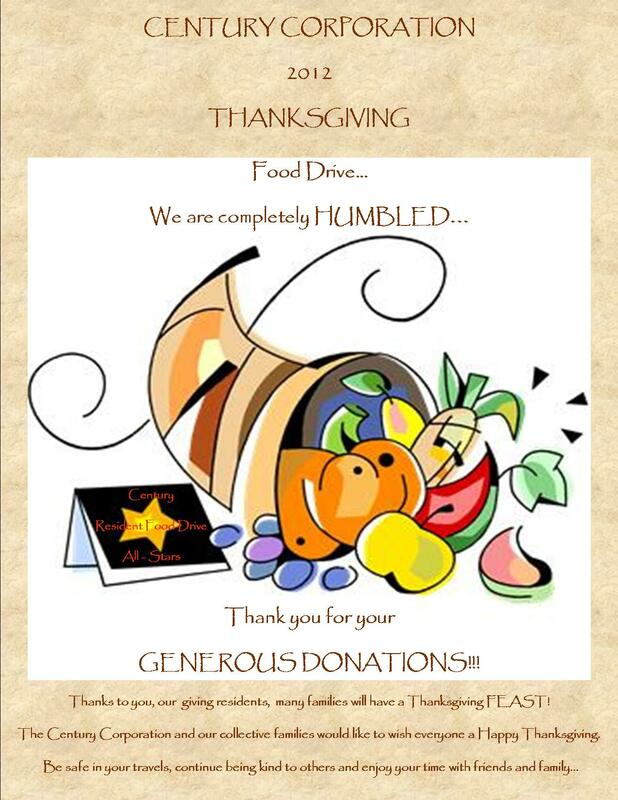 We are collecting donations at our leasing offices through November 15th.